After the acupuncture and flashbacks, Lin confronts her sister, who is training Korra. 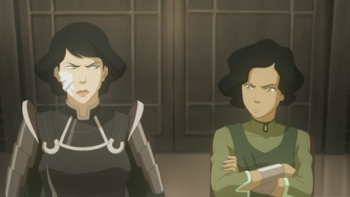 Lin blames Suyin for Toph leaving the police a year after the incident, but Suyin explains that she and Toph reconciled their differences. Of course, they resort to fighting, the metalbenders tearing apart the training ground before Opal intervenes. Lin, emotionally and physically exhausted from her acupuncture, passes out and sleeps for sixteen hours. When she wakes, she is rested and overly positive. It's an awkward, sudden change in the character that was appreciated for her steely demeanor and stubborn determination. It was a relief to see her apologize to Opal and convince her to leave the city to train, but the change is tremendous and seems too extreme given the circumstances. Apparently Lin's hardened personality was completely wiped away after throwing down with her sister? In any case, they reconciled and it looks like Team Avatar is ready to leave Zaofu, the safest city in the world. It looks like we will find out just how safe soon. Zaheer's gang makes an explosive escape from Republic City after his failed infiltration of Air Temple Island. Also, did P'Li just kill those pursuing police? As Sokka said in ATLA, "You know, it was really unclear." After meditating, Zaheer announces to his partners in crime that the Avatar is in Zaofu, so it looks like next week we'll really get into the arc of the season. Even after just three nights of episodes, this is the halfway point, so it's about time for a showdown between Korra and this season's antagonists. In the seventh episode of Book Three, "Original Airbenders," Korra and Team Avatar only show up for a moment, as this filler episode focuses on Tenzin and the airbenders he is attempting to train. Tenzin had difficulty teaching Korra, and it doesn't look like that is only an issue with the Avatar. After boring his students and not knowing how to handle his brother, Bumi, who has taken on the role of class clown, Tenzin gets some advice from Korra. Bumi, as ridiculous as he is, is well-respected as a military leader, and Korra suggest Tenzin approach him for advice. 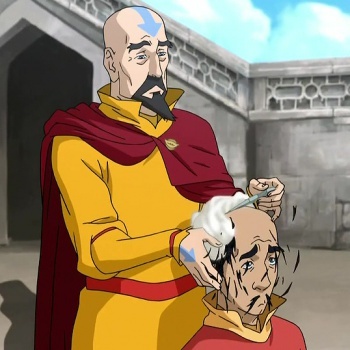 Tenzin goes all in with military-style training, forcing ten-mile hikes, intense training courses, and shaving one student's head (before mentioning it was optional). Jinora, his eldest child, tries to get Tenzin to rein it in, but he continues to push his students, leading to Bumi quitting his training. Jinora, encouraged by new airbender and romantic interest Kai, asks her father to let her get her airbender tattoos, something reserved for masters of the style. When Tenzin refuses to consider it, Jinora leaves. Kai, hoping to cheer Jinora up, takes her to some baby sky bison -- the flying creature Aang had in ATLA -- but they stumble upon poachers. Apparently, sky bison steaks sell for a lot of money in the Earth Kingdom city of Ba Sing Se, and the poachers know the Earth Queen will pay for airbenders to conscript as well. The events play out predictably from here. Kai picks the lock, the other airbending students and Meelo show up to help fight the poachers, and Kai and Tenzin stop the last poacher from getting away with the baby sky bison and Jinora. Still, the fighting is exciting, especially Kai and Meelo. Seriously, how bad must these earthbending poachers feel to get wrecked by a five year old? So far in Book Three, the younger and less powerful benders have been more exciting to watch during fight scenes than most anyone else. As the episode concludes, Tenzin agrees that Jinora may be mature and skilled enough to get her airbender tattoos. It's odd though, he comes to this conclusion after she storms off out of frustration and gets herself captured. Bumi and Tenzin discuss their youth and each other's similarities to their father as they resolve their conflict. And now the airbenders have become familiar with a herd of sky bison, something they were extremely limited on before. The second episode didn't seem to add anything significant to the seasonal arc, but it was still fun to watch. And with the second half of the season kicking off next week, it's likely that we won't have any more filler episodes until Book Four. Next week promises the confrontation between Zaheer's gang and Team Avatar -- so it should be an exciting couple of episodes!